The Win Sum Dim Sum slot may be a mouthful to pronounce if you are not used to Chinese cooking, but amateur slot players, rookies, and players on smaller scale budgets are going to be delighted with everything it offers. A new take on Chinese cuisine - Naturally, the first thing that is going to come to your mind when you hear the title of this new Microgaming developed video slot, is dim sum. Of course, we’re talking about the Chinese food. Microgaming’s Win Sum Dim Sum slot is a naughty pun on that same food, abut that’s not all the game is about. Read more about it, in our Win Sum Dim Sum slot review. As you can tell from the very moment you open up the Win Sum Dim Sum slot game. 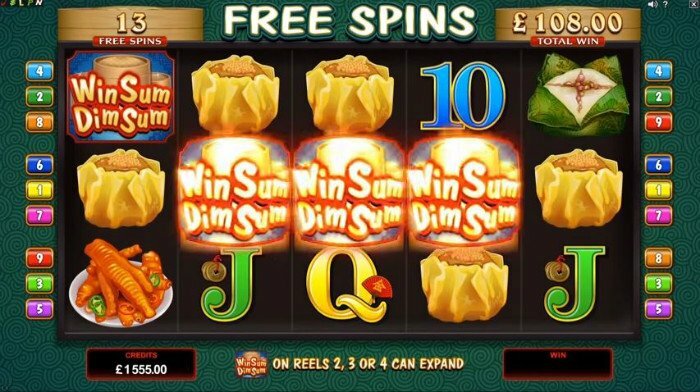 There are some creative and crafty Chinese takeaway imagery, and the Win Sum Dim Sum slot graphics are just a part of the excitement you can have on the reels of this game. Wagers, for instance, cost virtually nothing, and that is always going to make players smile. At the bottom of the reels of the Win Sum Dim Dum game are the wagering buttons. Players are going to be able to bet on a total of 9 paylines spread over the slot’s 5 reels. Selecting the lowest coin value will see them able to place bets of just 9p per spin if they wish, whilst maximum bets shouldn’t cost you any more than £90 a pop. That’s not bad since you can win as much as 30,000 coins via this game’s non-progressive jackpot. The Win Sum Dim Sum slot machine contains a wild icon which appears as a bamboo steamer. When this symbol appears, it can substitute for all other icons in the game. This shouldn’t come as too much of a surprise, since most Microgaming slots have wilds which work this way. However, if it lands on the third reel of the game, it can expand to create an entirely wild reel. This expanding wild can really make the difference, particularly if you have landed wilds on the other reels, too. If you are wondering, the Win Sum Dim Su logo acts as the wild icon in this slot. The only other special feature in this slot is a free spins bonus. Naturally, you’ll be needing scatter symbols to trigger that. 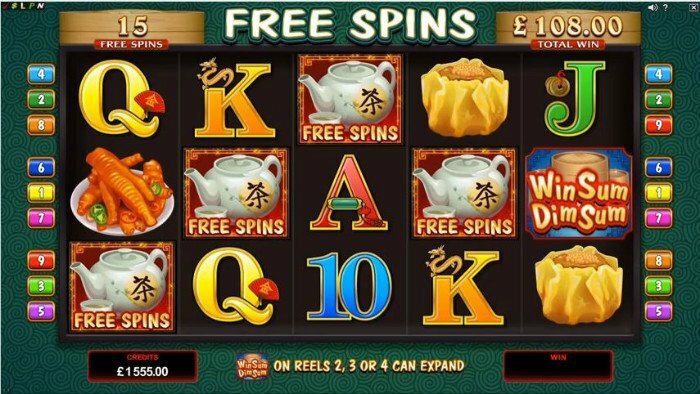 The other one of the Win Sum Dim Sum slot bonuses is a free spins bonus round, as we have just mentioned. This bonus round is activated by landing 3 or more of the free spin icons in any positions on the reels. This scattered teapot will also offer you scattered wins for your efforts, as well as the aforementioned free spins. In this bonus round, players will be able to win as many as 15 free spins, as well as land expanding wilds on the second, third, and fourth reels of the slot. Imagine what that could do for you wins. Win Sum Dim Sum launched in April 2016. 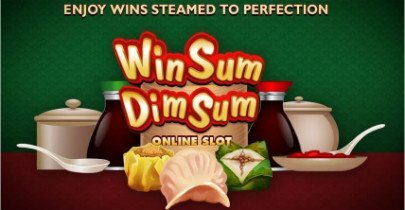 The Win Sum Dim Sum slot may be a mouthful to pronounce if you are not used to Chinese cooking, but amateur slot players, rookies, and players on smaller scale budgets are going to be delighted with everything it offers. Win Sum Dim Sum may not be the first Chinese food themed slot on the net, but it is (at the moment, at least), the best of them.